A unit of 4 beats (most of the time). You know when you hear musicians count to 4 at the beginning of a song? They’re counting the first bar. They do this at the speed of the song so that the other musicians know how fast to play. I know. Harmonic rhythm sounds kind of daunting. But all it means is how many chords you have in a bar and where those chords are placed. Take a look at the music example below. It should help. There are three different 4 bar harmonic rhythms – examples A, B, and C. One chord per bar (example A) is a different harmonic rhythm than two chords per bar (example B). And both of those have a different harmonic rhythm than one chord every two bars (example C). You need to be aware of this, because your songs will sound kind of lost if the chords are changing at random places. 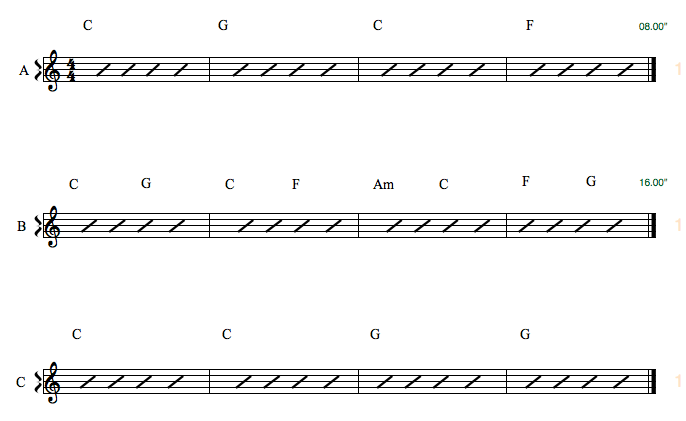 You’ll also get more interesting rhythmic ideas, like placing a chord on the 2nd beat or the 4th beat. Doesn’t sound that world-altering, but try it. Simple things lead to things you wouldn’t have otherwise thought of. One of those new ideas is to vary the harmonic rhythm. A full bar of C, then a half-bar of F, followed by a half-bar of G, then a full bar of Am. Whatever. Just start experimenting and have some staff paper handy to write things down (I have a free resource for staff paper in the next post). If you’d rather record things and write them down later, great. Just make sure you write it down. It comes in handy when you want to teach someone else the song. ‹ How to write chord progressions a pro would love, Part 3: How long is the verse?